One of the most interesting things about this original French underwater camera is that information on it is so hard to find. I have been trying to find the production figures, along with serial numbers, to no avail. If you happen to know, please email me. 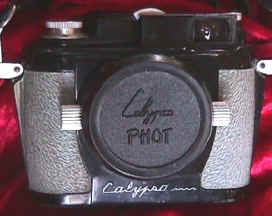 The Calypso is noteworthy in that it is the first successful underwater commercial still camera, and that it's the only production camera ever bought outright by Nikon and put into production as Nikon's own. 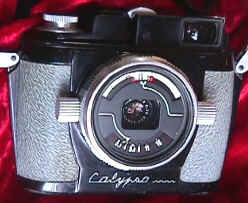 The Calypso was produced from about 1960 in France, with the design input of Jacques Cousteau. 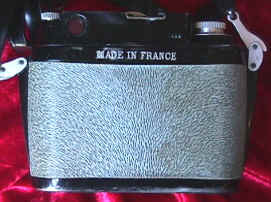 Nikon liked the design so much they bought the rights and started production of it in Japan about 1963. The Calypso originally was available with three lenses: the 35/3.5 SOM Berthiot Flor, a 28mm SOM Berthiot & a 45mm Angenieux. The 35/3.5 is a chrome lens, I imagine the others were too. 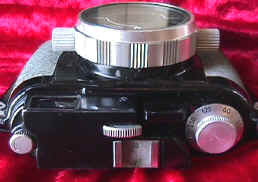 Early examples have a shutter speed dial to 1/1000. Later Calypsos go to 1/500th. The body covering is an imitation seal skin. Also made were special Calypso lens covers, camera strap, and flash. 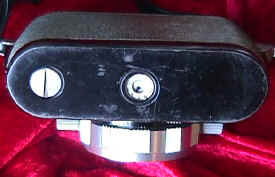 Nikon also produced a "Calypso-Nikonos," a "Calypso II" and "Calypso III" (versions of the Nikonos I, II, III respectively). These pictures are of # 1856 with a top shutter speed of 1/1000th.